Angel A. Yanagihara, Ph.D. of the Asia Pacific Institute of Tropical Medicine and the University of Hawaii is considered the foremost expert on box jellyfish and their treatment. Treatment of jellyfish stings has long been discussed among lifeguards and swimmers and generally misunderstood by the general public. "The response to the sting is not an allergic reaction. It is not at all like a bee sting. The venom of the box jelly contains ancient pore-forming proteins structurally similar to anthrolysin O and streptolysin O, the pore-forming toxins of anthrax and strep. People are not allergic to these pathogenic bacteria either. Our blood cells are uniquely vulnerable to box jelly porins and to bacterial porins. There is no immunity or resistance - it is a question of the dose delivered. Unfortunately, thinner skin areas of the body will allow a greater dose to be delivered. Women and children have thinner skin. So if an adult man is stung over thicker skin a smaller amount of venom will reach the blood stream than a sting of a child over a thinner skin region, such as face or neck." 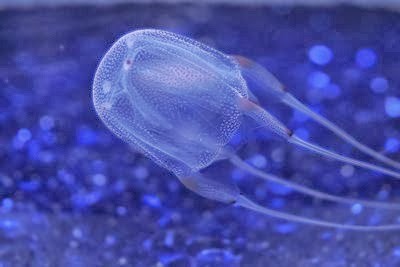 Some of the most persistently repeated treatments of jellyfish stings, and box jellies in particular, are with EPI pens. But Dr. Yanagihara who has carefully researched the chemistry of the jellyfish venom strongly advises against use of EPI pens. "EPI pens are absolutely contraindicated. I cannot stress this enough. I am conducting studies now involving box jelly venom injection into piglets. The data clearly show as our human whole blood studies show that the venom itself causes a massive rise in plasma catecholamines - EPI and NorEPI. This is well reported in the clinical literature as a "catecholamine surge". Adding an EPI injection on top of that situation is like adding fuel to a fire." She even reports a shocking revelation regarding use of EPI pens to alleviate the pain of a box jellyfish sting. "In fact, the losses of life that have occurred from box jelly sting have almost always involved well intentioned EPI administration. My studies are not yet published, but please be advised that the use of EPI pen is an extremely dangerous practice and yields no therapeutic benefit whatsoever. I am happy to share my unpublished data with local medical decision-makers. A Japanese tourist recently died after a sting from the same influxing box jellyfish species we have here (Alatina alata) in Saipan. Emergency treatment included EPI administration."